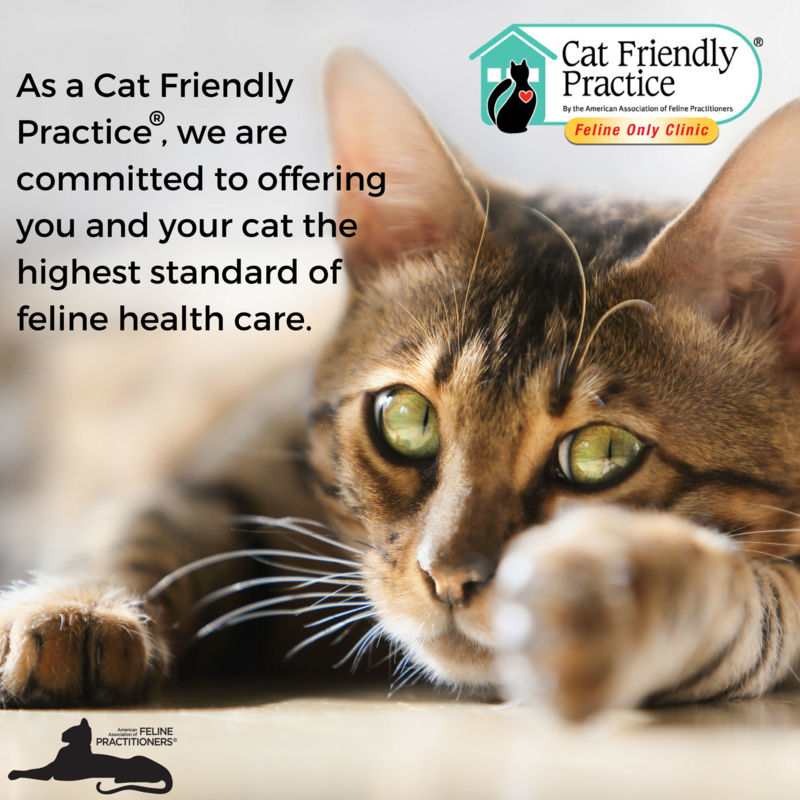 While consistently practicing state-of-the-art feline medicine when treating your kitty, we are a gold standard designated Cat Friendly Practice in accordance with standards set by the American Association of Feline Practitioners. We incorporate the highest levels of established cat-friendly criteria within our hospital and in our nuclear ward. We know that veterinary visits can be stressful for cats and cat owners. With each patient, we individualize our care and handling as we strive to limit the anxiety associated with ordinary visits so that our patients receive the best care in a non-threatening and welcoming environment. Cats do not feel safe when they are away from their normal home territory. We understand the unique needs of cats and pay the utmost attention to ensuring a calm, relaxing environment for both cat and owner. This includes prescribing calming medications if needed throughout your cat’s stay with us. Cats are highly sensitive to unusual sights, sounds and smells. We utilize calming pheromones and mood lighting in our nuclear ward. We encourage owners to bring a small toy or piece of clothing from home so that there are familiar scents to help relax your cat while hospitalized. Most cats prefer quiet and solitude and are highly stressed by dogs and other cats being in close proximity at the practice. Our nuclear ward accommodations include spacious cage suites for each patient. Each suite includes a hiding area, comfortable cushioned bedding, elevated benches (we all know that cats feel more comfortable in a new environment if they are hidden or up high), and soft music. Knowing that cats become aroused and anxious if they see other cats, our cage suites also do not allow visualization of other patients. Plus, we only treat cats—so no barking dogs, ever! Cats need to be handled gently, with care and respect in the practice. We hire only cat-compassionate team members. We've got some real "cat whisperers" on our team. Most cats are highly susceptible to stress and anxiety. We perform our pre-radioiodine patient examinations wherever your cat is most comfortable: in his or her carrier, on your lap, in the arms of a veterinarian or on the floor or examination table. Did we mention ‘no barking dogs’ and that we’re crazy about cats?